I have a bunch of "memes", basically quotes I like by different folks. For each person, my cute little avatar makes a comment, and the quote is included in the largest font I can manage. Scott and Helen Nearing are folks I quote, and my avatar calls them my favorite communists. I do not necessarily agree with everything they say, anymore than any other person I quote. It's the quote itself I am agreeing with. I use these little "memes" to post to social media cause I like the ideas expressed and am quite willing to have conversations on the topics covered. 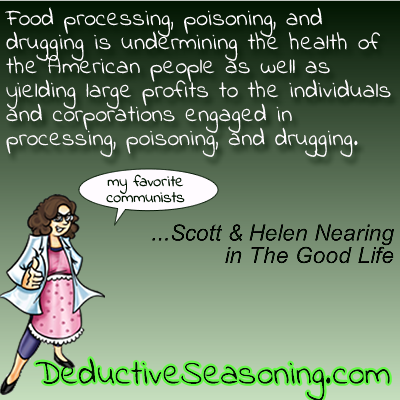 Recently posted on Facebook was the particular quote: "Food processing, poisoning, and drugging is undermining the health of the American people as well as yielding large profits to the individuals engaged in processing, poisoning and drugging." The question asked in reply was: " So you don't eat ground grain products, canned or bottled goods of any kind, or basically anything that is cooked in any way..because that is all processing right?" And I typed my reply, but Facebook wouldn't let it post because it was too long. These are the perils of being a verbose chick. For the vast majority of food, I do the processing here. Some processing is much less healthy than other types. For example, legumes contain phytates and lectins, both anti-nutrients, though with different modes of action. Soaking beans reduces phytates; pressure cooking reduces lectins. Canned beans do not go through both processes, so I don't buy them; I process dry legumes here. And it doesn't matter that it's not needed to cook them, I soak split peas anyways to reduce the phytates. It's about making the food not just yummy, but healthy. I have a blog post about how to cook your own beans in 5 minutes a day until you wind up with a freezer full of different "canned" beans as easy to use as the canned stuff. Though honestly, I usually just do the whole recipe in a pressure cooker of whatever I'm making. All your grains have high levels of phytates. Very few manufacturers soak, sprout or sour those grains in order to reduce phytates. You can get sprouted flour or real sourdough bread, but it's not the majority of what's in stores. I do not call the majority of what's in stores food at all, but "food-like products". Food comes from farms, or the wild, not factories. Cheerios is NOT a whole grain, you cannot plant them and get a field of Cheerios. It's ground, and thus the oils are oxidized and begin going rancid pretty much immediately. Look at the "butter" section in your grocery. More than 90% of what they are selling is not butter, but highly inflammatory vegetable oils chockful of omega 6 fatty acids. In short, poison instead of food. In addition to not processing foods to improve them, many foods are badly processed in ways that damage them. UHT pasteurization greatly increases the amount of oxidized cholesterol, as does any form of drying, even freeze-drying. Given that I already had a heart attack, I say "no" to oxidized cholesterol. Also, the cost of processing is crazy. Compare the cost, on a per pound basis, of wheat berries to even generic brands of cereal. I can soak to remove the phytates, then cook in my crockpot overnight, and have a whole pot of hot cereal that will feed a crowd for around 10 cents. And it's an actual whole grain. The current system is... the farmer makes squat, the consumer pays high, and General Mills gets rich. So... no, I don't want Cheerios, both for health reasons and cause it's a bad system for everyone involved except corporations. In general, I buy pastured meat, pastured dairy, vegetables and fruit. I buy most of this from local farmers. I buy small amounts of bulk grains, mostly rice and wheat. I do buy crappy white bread for Steve cause he insists. His "desserts" have very little sugar and are things like pumpkin pie and carrot cake - with little grain, properly prepared to reduce anti-nutrients, and mostly fruit or veg compared to what you can get in a store. The only processing I REALLY like is when they freeze organic fruit in season into bags so I can buy it in winter. I don't grow fruit, so while my freezer winds up well stocked with veggies, sometimes it ends up short on fruit depending on what I can find locally for a decent deal. Last year, I scored MAJORLY on wild blackberries, not officially organic, but a field that hadn't been sprayed for years. Also a big score of similar apples, just untended for years, so I got about a hundred pounds of those. Still have some in the freezer that I processed into Apple Betty and "fried" apples. There's a few other things as I look at my shelf. Organic coconut milk, dried coconut meat and expeller-pressed coconut oil; I can't get coconuts locally. Fair-trade chocolate and coffee, not so much for health as to avoid perpetuating slavery. Muscovado sugar, maple syrup, local honey for baking. Canned tuna, sardines, oysters and clams cause I no longer live near the ocean and the stuff they sell as "fresh" isn't usually (but the canned stuff is tricky, often canned in cottonseed oil for some reason, and cotton is not food unless you are a weevil). Peanut butter and other nut butters cause making my own was a pain, Vitamix or not. Sea salt. Tamari. Regular long-grain rice and risotto rice. Scottish oats. Larabars so I have some kind of emergency food in my purse when out and about, not real food, but a decent compromise overall. Oh, and my stevia, though I grow it, I've never figured out what to do next, so wind up just buying the plain stevia powder. My freezer has mostly various pastured meats, frozen fruit and veggies. Also a few baked goods, cause if I make pumpkin nut bread, I make 3 loaves and freeze 2, so there's always some backup baked goods in there. And there are literally gallons of various broths: chicken, turkey, beef, pork and ham. Store-bought broth is gross both in taste and in whatever they do to make it so nutritionally worthless. Mine has a thick layer of minerals that settles on the bottom; theirs has no calcium according to the nutrition facts. Mine when refrigerated is mostly a gelatinous mass that gives both the proper mouth-feel and the nutrition of added gelatin to whatever I'm cooking. Then mine has a lovely fat cap on top that melts into the soup or stew or risotto or whatever. Most mornings, I nuke a cup of broth with some coconut milk and sea salt and it's just the most luscious thing ever. There's also ice cream. I was doing my own for a while, but a local dairy is now making it with real ingredients, no crap. It's made with CREAM and it's dense and thick and awesome. Their chocolate peanut butter is to die for. My fridge has about 8 of those produce keeper thingies currently. I have a couple kinds of greens for juicing and salads, and a bunch of precut produce for stirfries. There's currently also about 30 dozen eggs as we've gotten behind the chickens. Lately, the stirfries have been meatless as I try to catch up with the eggs. I keep the almond meal in the fridge too. A box of Chardonnay currently. Raw milk for Steve, pasteurized half-and-half for my coffee, a good yogurt made by the same dairy that does the ice cream, several types of artisan, organic cheeses, several backup pounds of butter. A tupperware of cut watermelon. A giant "family" pack each of raspberries, blackberries and strawberries. Currently, the leftovers ready to nuke consist of fajitas, marinaded chicken, peppers and onions. I make the *best* fajitas. Hubby has a habit of looking at my shelves and saying, "There's nothing to eat, only ingredients!" Heh. We're not perfect by any means. I top my taco salads and chili with Fritos. The Larabars are a defense against buying convenience crap or drive-throughs when I'm out, a *needed* defense, I might add. And sometimes, we just say to hell with it all and get a pizza from the joint down the road. But, this is mostly how I roll - 90% of what I buy is real food. And easily 30-40% of what we eat, I grow (cause organic stuff is expensive). Cause... I am NOT having another heart attack. Nor is my husband, in a hard job that works 14 hour days sitting most of the time, going to gain a hundred pounds eating Subway and McDonald's every day like the other drivers. I am kinda fond of him and wanna keep him for a while. We promised each other 50 years and still owe each other 36.